Austrian bibliographer and Orientalist; born at Prossnitz, Moravia, March 30, 1816. He received his early instruction in Hebrew from his father, Jacob Steinschneider (b. 1782; d. March, 1856), who was not only an expert Talmudist, but was also well versed in secular science. The house of the elder Steinschneider was the rendezvous of a few progressive Hebraists, among whom was his brother-in-law, the physician and writer Gideon Brecher. 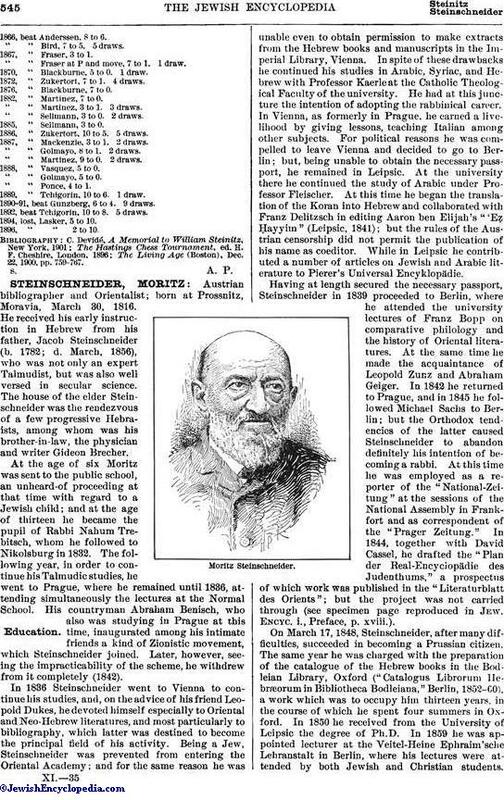 At the age of six Moritz was sent to the public school, an unheard-of proceeding at that time with regard to a Jewish child; and at the age of thirteen he became the pupil of Rabbi Nahum Trebitsch, whom he followed to Nikolsburg in 1832. The following year, in order to continue his Talmudic studies, he went to Prague, where he remained until 1836, attending simultaneously the lectures at the Normal School. His countryman Abraham Benisch, who also was studying in Prague at this time, inaugurated among his intimate friends a kind of Zionistic movement, which Steinschneider joined. Later, however, seeing the impracticability of the scheme, he withdrew from it completely (1842). In 1836 Steinschneider went to Vienna to continue his studies, and, on the advice of his friend Leopold Dukes, he devoted himself especially to Oriental and Neo-Hebrew literatures, and most particularly to bibliography, which latter was destined to become the principal field of his activity. Being a Jew, Steinschneider was prevented from entering the Oriental Academy; and for the same reason he was unable even to obtain permission to make extracts from the Hebrew books and manuscripts in the Imperial Library, Vienna. In spite of these drawbacks he continued his studies in Arabic, Syriac, and Hebrew with Professor Kaerle at the Catholic Theological Faculty of the university. He had at this juncture the intention of adopting the rabbinical career. In Vienna, as formerly in Prague, he earned a livelihood by giving lessons, teaching Italian among other subjects. For political reasons he was compelled to leave Vienna and decided to go to Berlin; but, being unable to obtain the necessary passport, he remained in Leipsic. At the university there he continued the study of Arabic under Professor Fleischer. At this time he began the translation of the Koran into Hebrew and collaborated with Franz Delitzsch in editing Aaron ben Elijah's "'ẓ Ḥayyim" (Leipsic, 1841); but the rules of the Austrian censorship did not permit the publication of his name as coeditor. While in Leipsic he contributed a number of articles on Jewish and Arabic literature to Pierer's Universal Encyklopädie. Having at length secured the necessary passport, Steinschneider in 1839 proceeded to Berlin, where he attended the university lectures of Franz Bopp on comparative philology and the history of Oriental literatures. At the same time he made the acquaintance of Leopold Zunz and Abraham Geiger. In 1842 he returned to Prague, and in 1845 he followed Michael Sachs to Berlin; but the Orthodox tendencies of the latter caused Steinschneider to abandon definitely his intention of becoming a rabbi. At this time he was employed as a reporter of the "National-Zeitung" at the sessions of the National Assembly in Frankfort and as correspondent of the "Prager Zeitung." In 1844, together with David Cassel, he drafted the "Plan der Real-Encyclopädie des Judenthums," a prospectus of which work was published in the "Literaturblatt des Orients"; but the project was not carried through (see specimen page reproduced in Jew. Encyc. i., Preface, p. xviii.). On March 17, 1848, Steinschneider, after many difficulties, succeeded in becoming a Prussian citizen. The same year he was charged with the preparation of the catalogue of the Hebrew books in the Bodleian Library, Oxford ("Catalogus Librorum Hebræorum in Bibliotheca Bodleiana," Berlin, 1852-60), a work which was to occupy him thirteen years, in the course of which he spent four summers in Oxford. In 1850 he received from the University of Leipsic the degree of Ph.D. 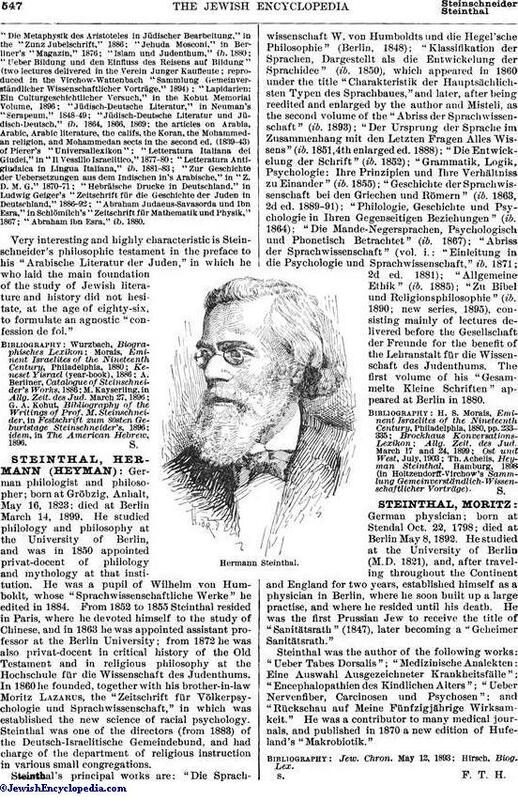 In 1859 he was appointed lecturer at the Veitel-Heine Ephraim'sche Lehranstalt in Berlin, where his lectures were attended by both Jewish and Christian students.From 1860 to 1869 he served as representative of the Jewish community at the administration, before the tribunals of the city, of the oath More Judaico, never omitting the opportunity to protest against this remnant of medieval prejudice. 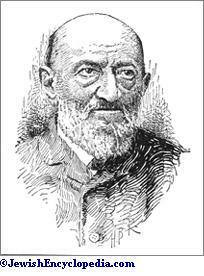 From 1869 to 1890 he was director of the Jüdische Mädchen-Schule (school for girls of the Jewish community), and in 1869 he was appointed assistant ("Hilfsarbeiter") in the Royal Library, Berlin. From 1859 to 1882 he edited the periodical "Hebräische Bibliographie." In 1872 and 1876 he refused calls to the Berlin Hoch schule für die Wissenschaft des Judenthums and the Landesrabbiner-Schule in Budapest, respectively, holding that the proper institutions for the cultivation of Jewish science were not the Jewish theological seminaries, but the universities. 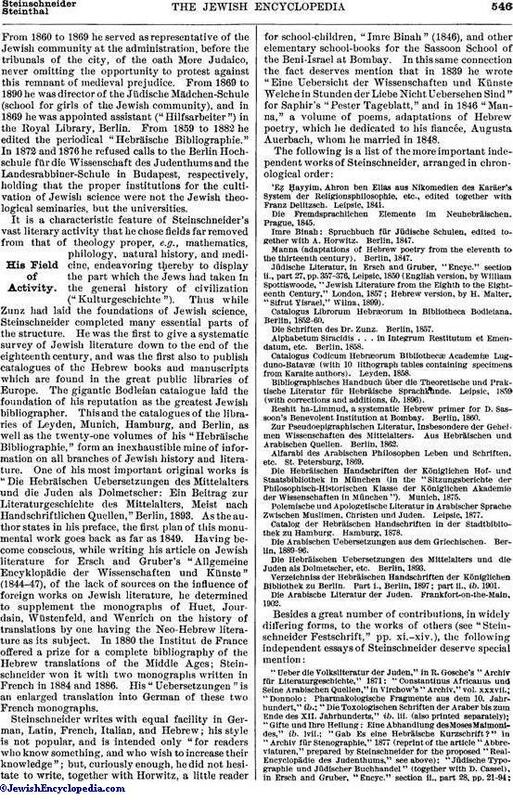 It is a characteristic feature of Steinschneider's vast literary activity that he chose fields far removed from that of theology proper, e.g., mathematics, philology, natural history, and medicine, endeavoring tḥereby to display the part which the Jews had taken in the general history of civilization ("Kulturgeschichte"). Thus while Zunz had laid the foundations of Jewish science, Steinschneider completed many essential parts of the structure. He was the first to give a systematic survey of Jewish literature down to the end of the eighteenth century, and was the first also to publish catalogues of the Hebrew books and manuscripts which are found in the great public libraries of Europe. The gigantic Bodleian catalogue laid the foundation of his reputation as the greatest Jewish bibliographer. This and the catalogues of the libraries of Leyden, Munich, Hamburg, and Berlin, as well as the twenty-one volumes of his "Hebräische Bibliographie," form an inexhaustible mine of information on all branches of Jewish history and literature. One of his most important original works is "Die Hebräischen Uebersetzungen des Mittelalters und die Juden als Dolmetscher: Ein Beitrag zur Literaturgeschichte des Mittelalters, Meist nach Handschriftlichen Quellen," Berlin, 1893. As the author states in his preface, the first plan of this monumental work goes back as far as 1849. Having become conscious, while writing his article on Jewish literature for Ersch and Gruber's "Allgemeine Encyklopädie der Wissenschaften und Künste" (1844-47), of the lack of sources on the influence of foreign works on Jewish literature, he determined to supplement the monographs of Huet, Jourdain, Wüstenfeld, and Wenrich on the history of translations by one having the Neo-Hebrew literature as its subject. In 1880 the Institut de France offered a prize for a complete bibliography of the Hebrew translations of the Middle Ages; Steinschneider won it with two monographs written in French in 1884 and 1886. His "Uebersetzungen" is an enlarged translation into German of these two French monographs. Steinschneider writes with equal facility in German, Latin, French, Italian, and Hebrew; his style is not popular, and is intended only "for readers who know something, and who wish to increase their knowledge"; but, curiously enough, he did not hesitate to write, together with Horwitz, a little reader for school-children, "Imre Binah" (1846), and other elementary school-books for the Sassoon School of the Beni-Israel at Bombay. In this same connection the fact deserves mention that in 1839 he wrote "Eine Uebersicht der Wissenschaften und Künste Welche in Stunden der Liebe Nicht Uebersehen Sind" for Saphir's "Pester Tageblatt," and in 1846 "Manna," a volume of poems, adaptations of Hebrew poetry, which he dedicated to his fiancée, Augusta Auerbach, whom he married in 1848. 'Eẓ Ḥayyim, Ahron ben Elias aus Nikomedien des Karäer's System der Religionsphilosophie, etc., edited together with Franz Delitzsch. Leipsic, 1841. Die Fremdsprachlichen Elemente im Neuhebräischen. Prague, 1845. Imre Binah: Spruchbuch für Jüdische Schulen, edited together with A. Horwitz. Berlin, 1847. Manna (adaptations of Hebrew poetry from the eleventh to the thirteenth century). Berlin, 1847. Jüdische Literatur, in Ersch and Gruber, "Encyc." section ii., part 27, pp. 357-376, Leipsic, 1850 (English version, by William Spottiswoode, "Jewish Literature from the Eighth to the Eighteenth Century," London, 1857; Hebrew version, by H. Malter, "Sifrut Yisrael," Wilna, 1899). Catalogus Librorum Hebræorum in Bibliotheca Bodleiana. Berlin, 1852-60. Die Schriften des Dr. Zunz. Berlin, 1857. Alphabetum Siracidis . . . in Integrum Restitutum et Emendatum, etc. Berlin, 1858. Catalogus Codicum Hebræorum Bibliothecæ Academiæ Lugduno-Batavæ (with 10 lithograph tables containing specimens from Karaite authors). Leyden, 1858. Bibliographisches Handbuch über die Theoretische und Praktische Literatur für Hebräische Sprachkunde. Leipsic, 1859 (with corrections and additions, ib. 1896). Reshit ha-Limmud, a systematic Hebrew primer for D. Sassoon's Benevolent Institution at Bombay. Berlin, 1860. Zur Pseudoepigraphischen Literatur, Insbesondere der Geheimen Wissenschaften des Mittelalters. Aus Hebräischen und Arabischen Quellen. Berlin, 1862. Alfarabi des Arabischen Philosophen Leben und Schriften, etc. St. Petersburg, 1869. Die Hebräischen Handschriften der Königlichen Hof- und Staatsbibliothek in München (in the "Sitzungsberichte der-Philosophisch-Historischen Klasse der Königlichen Akademie der Wissenschaften in München"). Munich. 1875. Polemische und Apologetische Literatur in Arabischer Sprache Zwischen Muslimen, Christen und Juden. Leipsic, 1877. Catalog der Hebräischen Handschriften in der Stadtbibliothek zu Hamburg. Hamburg, 1878. Die Arabischen Uebersetzungen aus dem Griechischen. Berlin, 1889-96. Die Hebräischen Uebersetzungen des Mittelalters und die-Juden als Dolmetscher, etc. Berlin, 1893. Verzeichniss der Hebräischen Handschriften der Königlichen Bibliothek zu Berlin. Part i., Berlin, 1897; part ii., ib. 1901. Die Arabische Literatur der Juden. Frankfort-on-the-Main, 1902. "Abraham ibn Esra," ib. 1880. Very interesting and highly characteristic is Steinschneider's philosophic testament in the preface to his "Arabische Literatur der Juden," in which he who laid the main foundation of the study of Jewish literature and history did not hesitate, at the age of eighty-six, to formulate an agnostic "confession de foi." idem, in The American Hebrew, 1896.